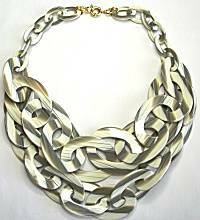 One of the looks in necklaces that is more substantial includes multiple strands. You may do this with several individual necklaces also, try varying the lengths. See also the Long & Rope necklace page, where you can wrap them into multiple strand looks! 3 strands of 10-12mm FLUORITE teardrops are gathered in fancy sterling end caps, holding a pendant of ABALONE mosaic. The fluorite stones are naturally clear, lavender and purple, green and blue. The pendant is 2-1/4 inches long including bail, the scallops of abalone shell are joined to a resin base and set in sterling silver, the colors are glowing gray, blue, pink and green. 19 inches long, toggle clasp. Triple strand necklace is 16.5 inches long with sterling toggle clasp, can be shorter if strands are twisted. One strand is champagne color FRESHWATER PEARLS and the other is white, about 6-8mm in size. The third strand is ABALONE PEARL, they come from the inner shell of the abalone are are partially-formed pearl shapes, shimmering in peacock/gray luster but of irregular forms. They vary in size up to 5/8 inches long. Coordinating earrings are BIWA PEARL with FRESHWATER PEARL, in a choice of peacock color or white. About 5/8 inch wide, 1.5 inches long on sterling leverback earwire. 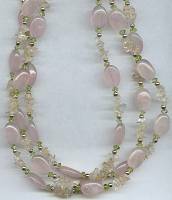 Pastel colors in this 3-strand necklace that features ROSE QUARTZ in flat oval cut (about 9x13mm), mixed with CITRINE pale yellow chips and PERIDOT rough cut spacer beads. Small sterling beads break the color sections. Toggle clasp. 17 inch finished length, that can be worn shorter by twisting. 3 strands of 27 inch Zulugrass. On VERY STRONG elastic, the natural grass is dried, dyed, and joined with glass beads. Wear all 3 strands together as a necklace slipped over your head, or twist them into bracelet, anklet, hair tair, join together around the waist or a long necklace. The colors are bright purple, orchid, fuchia/rose. 19 inches long, 1 inch wide, this is a wonderful color-splash to surround the neck. 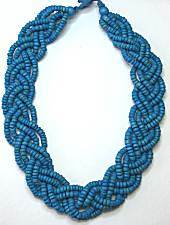 6 strands are beaded with dyed nuts (or wood), saturated color of dark turquoise blue. A flat braided style, that you can wear flat as shown, or twist to shorten a bit. Closes with suede thong over wood bead, no metal! 2-3/4 inch pendant is flat disk with pattern on both sides, classic carpet motif in teal blue, turquoise, brown and gold, glossy finish. It is suspended from deep teal blue beads, 17 inches long plus 3 inch extender chain and lobster clasp. Super lightweight with a big bold look! 20 inches long, plus 2 more inches on golden extender chain. 10 strands work together beautifully, mixing black matte glass beads with natural gemstones like jasper, mother-of-pearl, amazonite and green agate, and crystals in sparkling mint and champagne. Altogether, the strands are about 3/4 inch thick draping around your neck gracefully. 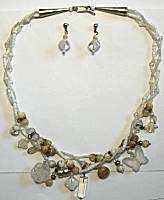 By The Artful Soul, necklace set in white, frost, ivory and cream. The necklace is 3 strands of glass seed beads that are braided together into 17 inch long piece. Suspended within the braiding are dangles and larger beads in rather random fashion. Pieces include frosted lucite, mother-of-pearl, river jasper, vintage Czech glass and Swarovski crystal. 1 inch long earrings of Czech glass and mother-of-pearl, surgical steel post. 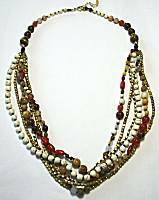 Triple strand beaded necklace offers neck-filling color without a heavy look. Note that the tiny beads extend color between the larger ones, the colors are metallic coppeer and bronze, salmon pink, peachy pink, coral red at center. Copper finish extender chain in back adjusts length 16-18 inches with lobster clasp. 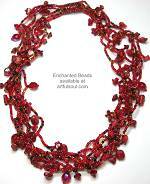 18 inches long, 6 strands of glass seed beads have larger beads attached at regular intervals making for a busy look in rich tomato and cherry red colors. About 3/4 inch wide. Magnetic clasp that is completely covered in beads (no metal showing). Red crystals, shell and stone chips. 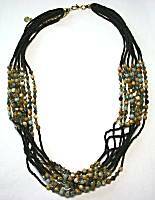 18 inches long, 6 strands of glass seed beads have larger beads attached at regular intervals making for a busy look in deep golden brown and chocolate colors. About 3/4 inch wide. Magnetic clasp that is completely covered in beads (no metal showing). 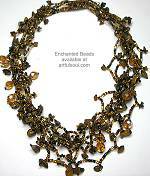 Bronze, amber and black glass, topaz yellow crystals, golden tigers-eye chunks.